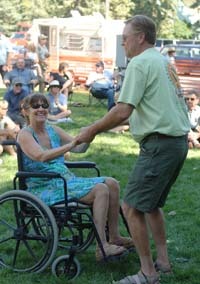 Former Bellevue Mayor Jon Anderson dances with his wife, Linda Vaughan, at the Northern Rockies Folk Festival in 2007. Former Bellevue Mayor Jon Anderson and his ex-wife, Linda Vaughan, were found dead Tuesday morning at their home at 320 Walnut St. in Bellevue. Police are investigating the deaths as a possible murder-suicide. Police were alerted to the scene at about 9 a.m. Tuesday morning by a caregiver employed by the Blaine County Senior Connection. Wood River Fire & Rescue ambulances were dispatched to the scene but were promptly sent back to their stations. A news release issued Tuesday afternoon by the Hailey Police Department—which contracts with the city of Bellevue to provide law enforcement—states that Vaughan, 58, was "an apparent victim of a homicide." The statement says Vaughan was found lying beside Anderson, 55, who appeared to have died of a self-inflicted gunshot wound. "Information gathered at the scene indicates a murder-suicide event," the police statement says. "Both Vaughan and Anderson were residents of 320 Walnut and were living together amicably." The incident is being investigated by the Bellevue Marshal's Office and the Hailey Police Department, with assistance from the Idaho State Police crime scene unit. Anderson served as Bellevue's mayor for five years before resigning in June 2010. After his resignation, he faced drawn-out DUI-related court proceedings in Lincoln and Blaine counties.